We left Everest Base Camp 6 days ago and trekked the 17kms back down to Lobuche Base Camp (4700m) where we had been a week before. The air was thick and we all slept well that night. The next morning packed up our climbing gear and headed up to Lobuche High Camp (5200m approx). We ate an early dinner that evening and went to sleep at 18:30. At 02:30 we were woken up for a quick breakfast, packed our bags, readied our climbing hardware and got ready for a 04:00 departure, heading up to the east summit of Mt Lobuche (6119m). It had been snowing the whole night and just before we were due to leave we were shut down. With all the fresh snow it would have been a perilous descent and wasn’t worth the risk as we were in no rush so we went back to sleep until around 08:00. We then packed all our gear and headed back down to Lobuche Base Camp. Spirits were low and we were a little annoyed to have to spend another night in this place which was fast becoming way too familiar. The next morning we once again packed our gear and headed up to High Camp. The weather for the next morning was calling for a bit more precipitation so we were not too confident that we would make it out of the tents. We got the call at 02:30, the sky was clear, it was on. We packed our backpacks, put on our climbing hardware and headed out at 04:00. The climb was longer than expected. We started out in the dark with head torches and trudged through the snow slowly climbing in altitude towards the black silhouette above us. The sky started to brighten as we moved around the rock bands and headed up to the fixed lines. The fixed lines were steeper than expected and full of people who had questionable techniques such as losing crampons half way up the icy slope, sitting on the fixed line blocking everybody from passing and other annoying and possibly dangerous situations. The sun was well above the horizon by now and we started to heat up quickly whilst we were clipped to the side of the mountain. I made the terrible decision to put on my big down parka during our last break and did not take it off before going up the last part of fixed lines. Within 30 minutes I was baking and quickly becoming dizzy with heat exhaustion. I started seeing a shimmering in the centre of my eyesight, I wasn’t sure if it was snow blindness or a migraine. We were not really in a position to take off backpacks and jackets so I put up with the scorching inferno and pressed on. After about an hour we reached the top of the lines and topped out on Lobuche East at 6119m. The summit was crowded, I stripped off most my layers to try and cool down which helped immediately. We all gathered around for some celebratory photos and to consume some calories before putting all our gear back on, clipping back into the fixed lines and beginning the difficult and steep descent back down. More people were coming up and were once again blocking our descent. We had to step over and clip around people on the way back down which was annoying but great practice for Everest where we will see these types of queues tenfold. It took us 4.5 hours to get to the top which I am told is a pretty good time from Lobuche High Camp. We took about 2 hours to come down. We stumbled into camp, ate some noodles and soup and laid around for an hour trying to recover some energy before pressing on back down to Lobuche Base Camp. After a great night’s sleep, we got up this morning, packed all our gear, said goodbye to Lobuche Base Camp once and for all and headed off for the 17km trek back to Everest Base Camp. The trek was incredibly easy compared to the first time we did it as we are now well acclimatised plus the strenuous parts of the climb yesterday seemed to activate some sort of dormant fitness I have not used since training back home and now any hill is a breeze. Having said that, after a few rest days we will start to move up Everest and I am sure those first few days through the Icefall up to Camp 1 will be tough. The team is doing well, everybody seems to have recovered from their different illnesses and we seem to now have a nice hygienic quarantined zone in our Base Camp with the viruses and bugs of the Tea Houses a distant memory. 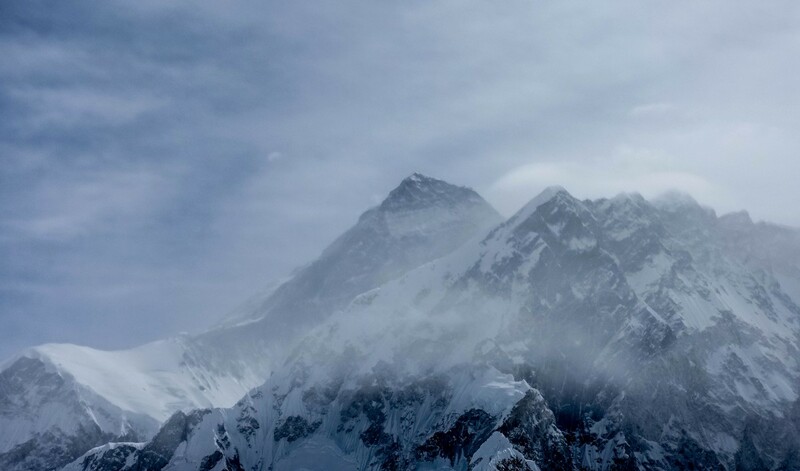 We are now done with the trekking and all movements from here on in will be up and down Everest herself. For now though we get a nice long 3–4 day rest which will be a good chance to clean all my clothing (plus myself) and get my mind focussed on what is ahead. EVEREST. This entry was posted in Everest 8848m (2015) and tagged Alpine, Alpinism, Alpinist, Base Camp, Climbing, Equipment, Everest, Everest Base Camp, Expedition, Kathmandu, Lobuche, Mountaineering, Mountains, Nepal.